If you headed over to the crafting competition, So You Think You're Crafty, and voted a couple weeks ago, you recognize this picture! Thanks, by the way! I'm officially a part of Season 12 in So You Think You're Crafty! Here's my attempt at sharing the tutorial. There are a few missing pictures here and there, but let me know if you have any questions!! While I did make this necklace for a bride to wear during her wedding, it's a great statement necklace that could be worn dressed up or down! I think it would be totally precious with a white tee, skinny jeans and heels(or most likely flats if you're me)! 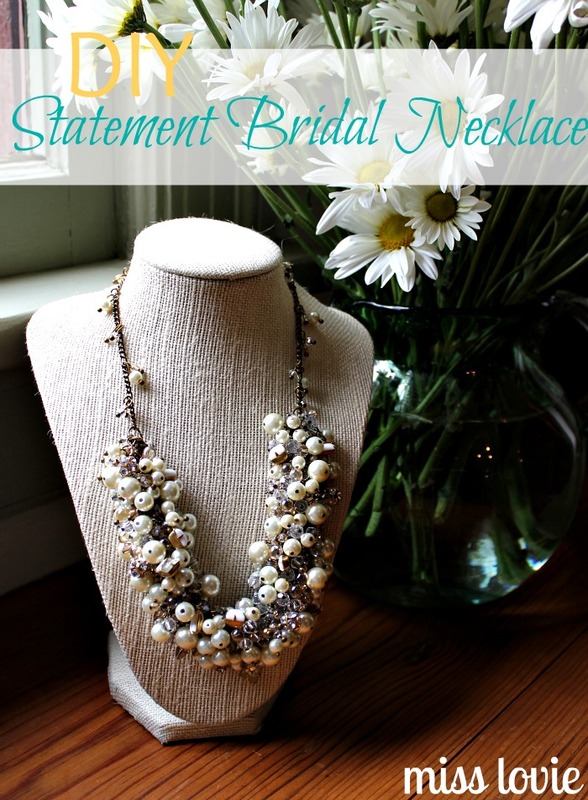 When my good friend asked me to make her necklace for her wedding, I was honored and excited. Then I saw the picture of what she wanted it to look like and I got nervous. It looked intricate and like a LOT of work. And it was, of course, but also so fun. This project is one of my all-time favorites. 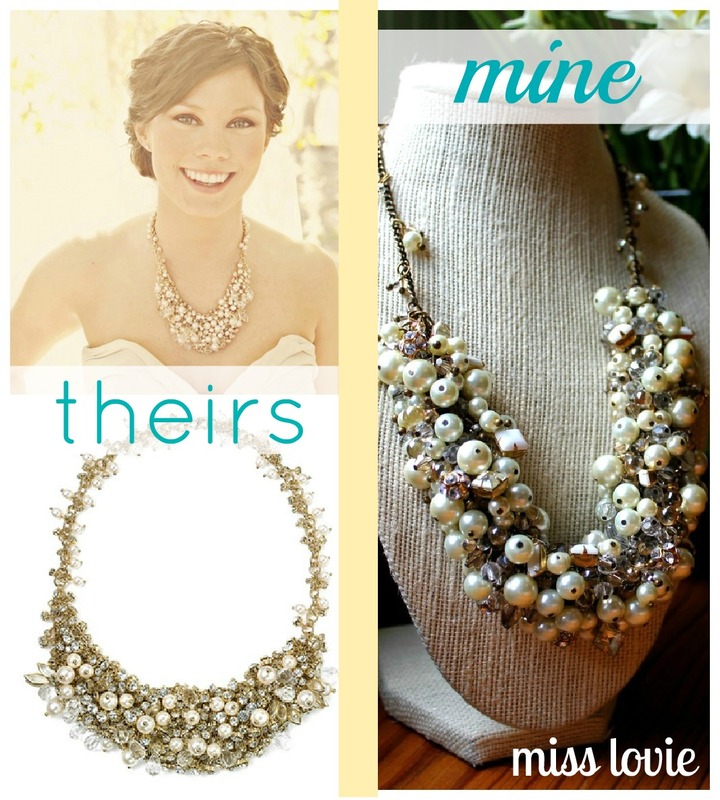 The top left picture was the Cara Accessories Pearl and Crystal Necklace on The Ruffled Blog in a wedding shoot. The necklace was supposedly found at Nordstrom...not sure if they have it anymore). I'm pretty sure I have that same top left image pinned at least 5 times among my boards. Ha. The bottom left picture is just a clearer picture I found here of the same necklace. And, of course, the picture on the right his mine. As you can see, the original lays flat. Mine did not. It curled up and is more like a tube. While it wasn't exactly what I was going for, it was a pleasant surprise and I think it still turned out beautifully. Maybe next time I make it I'll attempt to find a way to do it differently so it will lay flatter. I may have jammed too many beads on there which caused it to roll...not sure! 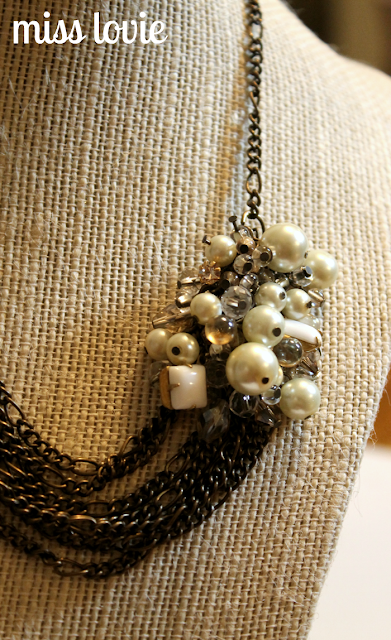 With over 650 hand-wired beads, this necklace is definitely a statement piece. The base of the "bib" part is 8 strands of antiqued bronze chain. I just love the mix of the beads. 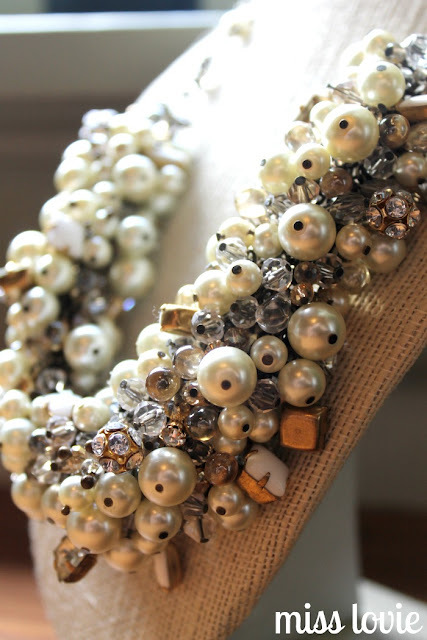 I used different sized pearls, vintage glass stones, rhinestone clusters, seed beads, champagne colored drops and faceted beads as well as clear faceted beads all on antiqued brass. Wanna make your own? Ok! 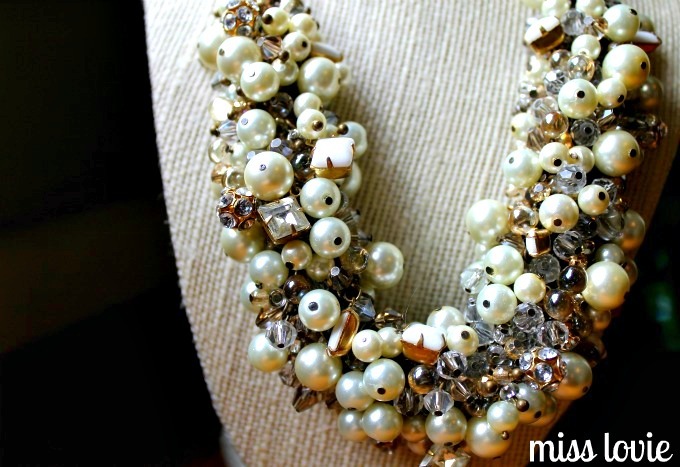 (I searched Etsy for some interesting vintage pieces to mix in with my usual mix from Michael's) : large, medium, and small pearls, clear faceted beads, champagne-colored faceted beads, tiny sead beads (pearl, clear, or champagne), anything you find interesting. You should have a much larger pile of these beads with simple loops when you're done with the first step. First, you create hundreds upon hundreds of these: simple loops above your beads. To create a simple loop you need, (clockwise from left), wire cutters, needle nose pliers, bent nose pliers, your bead, and a flat head pin. Make a ton of these!! This part is easy, but time-consuming! 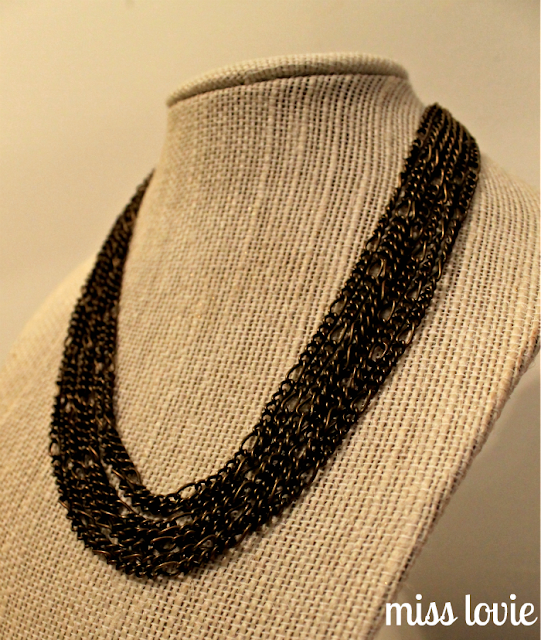 Next, create the 8 strand chain bib. To be totally honest, this took me awhile to get right. It needs to be perfect so that the chain lays together exactly side by side. I was unsure how to cut the chain to the right lengths so I used the above method placing the sections of chain side by side and then just cutting them accordingly. It seems that each chain that sits "on top" of the chain below should be just a tiny bit shorter than the one below it. The actual amount of how much shorter will change depending on the width of your chain lengths. Mine was extra difficult to calculate sine I was using the Mother/Son (figaro) chain (large link and small links combined). The longest chain is about 10 inches long (give or take some depending on how long you want this portion of the necklace/how far down you want the necklace to lay on your chest). Each chain on my necklace was about 4 small links shorter than the one prior. Once you have the chains cut to the lengths you think might work, add them to one of your large jump rings (sorry there isn't a picture for these steps) and then add the other sides of the chains to the other jump ring, making sure to add the chains in the correct order so they don't twist! Pin both jump rings to your bust (as pictured above even though the pins are behind the neck portion of the bust...sorry!) My chains still weren't exactly correct so I basically cut and added links to the chains until they laid correctly one directly on top/next to the other. It's difficult to keep them straight and to tell which chain should lay there so I often (while assembling this part of the necklace and while attaching the beads) would lift each strand one by one of the necklace and let it fall so it would lay correctly. See picture above. This part of your necklace is shorter than it appears above, as well. The ends of it where each jump ring is should hit at your collar bones. 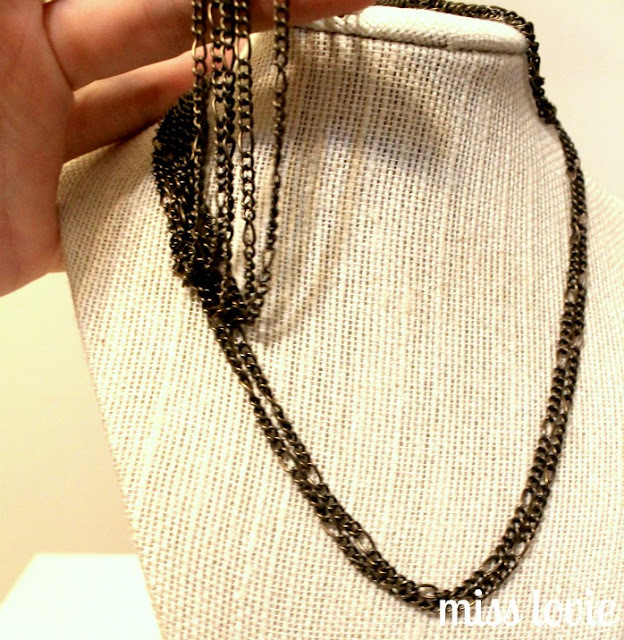 And as stated above, the longest chain (the one that sits on the bottom) should be around 8-10 inches long depending on how far down your chest you want it to hang. The remainder of the necklace (extending from your collar bones around your neck) is a single chain (as seen in the picture below), and we'll discuss how to assemble it later. 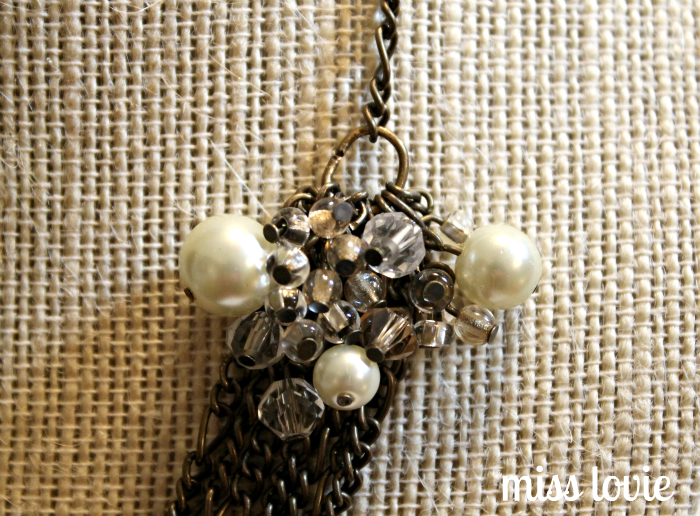 Next, attach the beads on simple loops to the necklace (as seen in the picture above). Gather some good beads you want to go together. Attach large beads as individuals and small and medium beads as clusters. The clusters are used to fill large spaces and they help the beads stay close to each other so you can fit in more beads or bead clusters.You can make several types of clusters: a cluster with 4 or 5 small beads, a cluster with 1 medium bead and 3 small beads, a cluster with 3 medium beads, or whatever you think will work in that space you're working in. 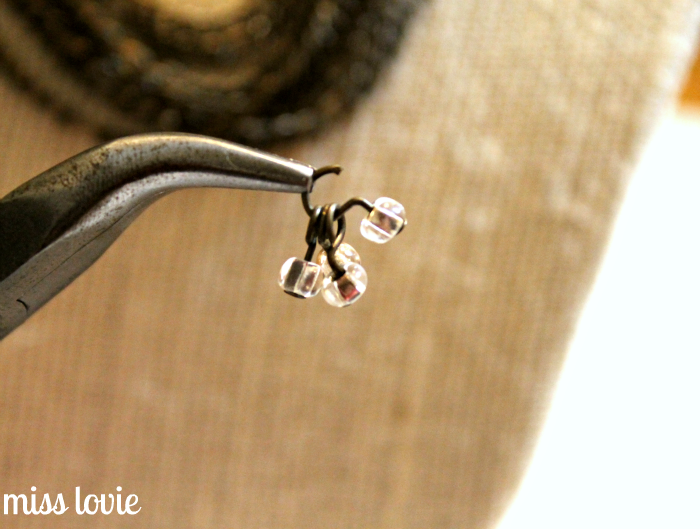 Here's one way to attach the beads: Open up a simple loop with your round nose pliers, hold the wire with your bent nose pliers and slide on two chains connecting them and then use your flat nose and bent nose pliers to close the simple loop around the two chain links. Before connecting chains, be sure the two chains you're connecting are supposed to be next to each other. Remember, I did this by lifting the chains one by one and separating them so I could see which chains should go where. Another way is to attach the clusters to the chains in the same way. Usually when I make a cluster, I use a small jump ring, but when I tried that, I found that this was causing there to be too much space between the cluster and the chain. Instead, I made a cluster out of a simple loop that was already on the bead. Simply take your round nose pliers and stick one side of them into the loop and pull to pry it open. Slide on the beads you want into the loop and determine a spot for your cluster. I recommend starting from one side and working your way around to the other side (not like the picture below shows you!!) 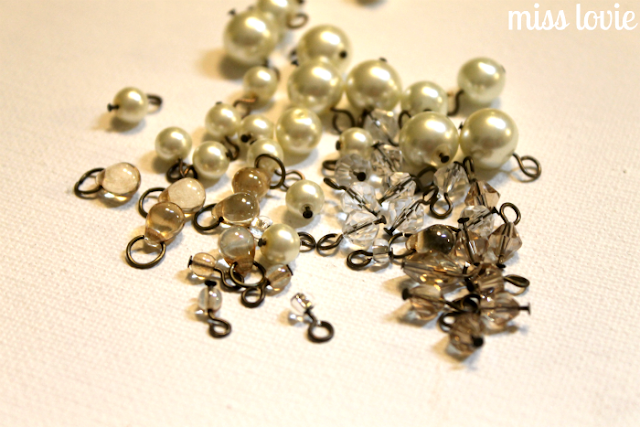 Place each bead or bead cluster directly under the one you just attached. The above picture is simply showing you how to connect your chains as you put on the cluster. 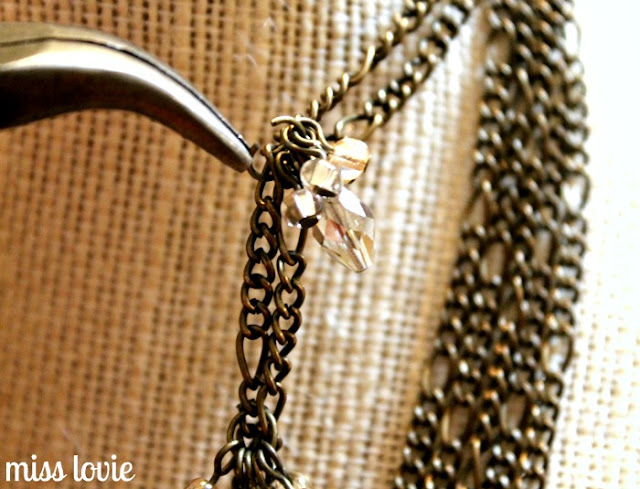 Use your bent nose pliers to hold the open loop with the other beads on it and slide two chains onto the loop (making sure those two chains are supposed to be next to each other!) 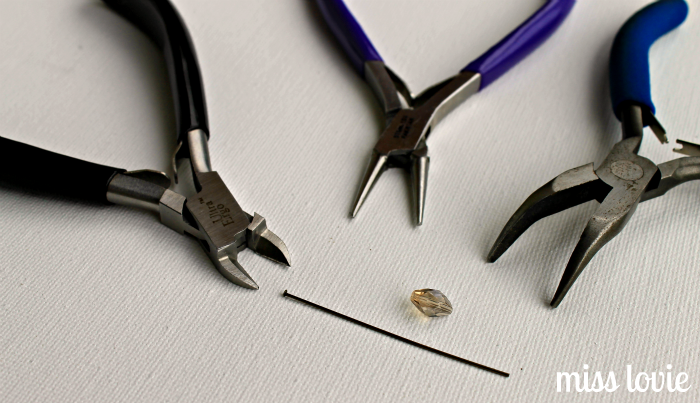 and then use your flat nose pliers and bent nose pliers to close the loop again around the chain and all the other beads. You will have to lift up beads to see the next closest place to attach new beads or bead clusters. No chain should be showing in between. 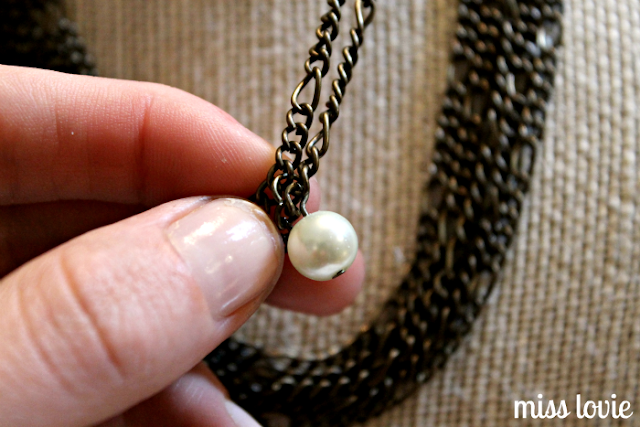 Also you should work your way down the necklace from one side to the next as well as working across the width of it. As you go, make sure there are no parts of the necklace where the chains are not connected. If this happens, it creates a hole where attached beads can fall through and get trapped behind the bib instead of in front! Last, create the remaining portion of the necklace and attach the clasp. For the next part, I didn't take any pictures because I was feverishly trying to finish it in time. Whew. 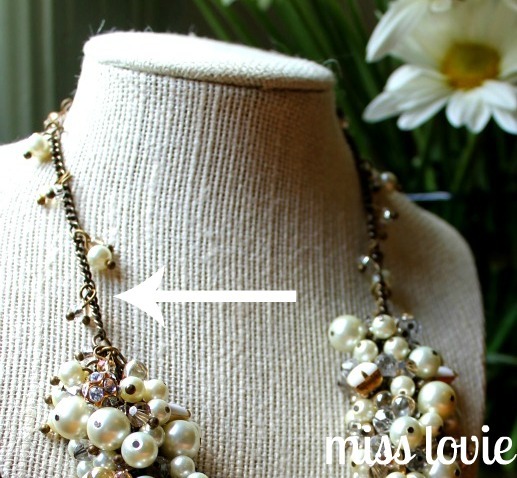 But the above picture shows what this part of your necklace should look like. 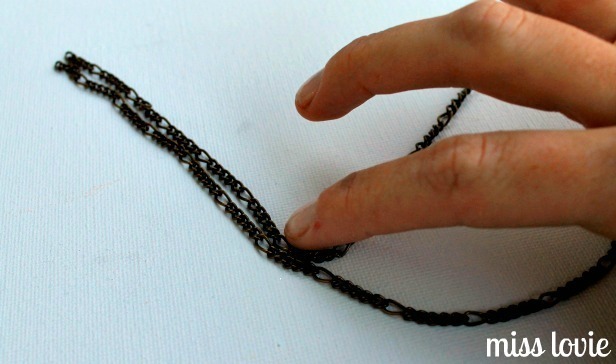 Create this part by cutting a 10 inch section of chain and cutting it in half again. Attach a chain to each side of the bib by opening up the large jump rings and sliding on the chain and closing them securely again. Attach a lobster clasp to one end of the chain on one side and the last large jump ring on the other side. This is your clasp. Then simply add small clusters of beads by opening up the simple loops of them and attaching them directly to the chain on both sides sporadically. If you want to make this, and have any questions, please feel free to email me and ask me or leave it in the comments here. I will be more than happy to make any clarifications that may be needed! This was a long post with a few steps missing from pictures so I totally understand if you're lost!! ha. That is so beautiful! Something I would never make, looks way to hard for me, but I would pay for it! So beautiful, great job! oh my this is so beautiful!!! Gosh what alot of work in this - I would love to try making jewelry but this looks like it should be left to the pros like you! It's realy beautiful. I love it but I wouldn't have patience to make sometihng like this. This is gorgeous! You did a fabulous job. 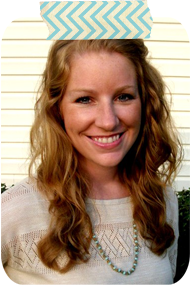 first - OF COURSE we knew this was your project in the contest - it had your style and attn. to detail all over it! I' love to bead, but I can't even imagine how long this must have taken . Amazingly beautiful! BEAUTIFUL! I can't imagine how long this took! How much did it cost to make?! Wow!! That is a beautiful necklace! & great tutorial as well. That is a beautiful necklace! You are so patient and talented! Stunning! I don't think my patience would hold up long enough to finish! Beautiful job! It may not be exactly like the original but it's absolutely gorgeous! Wonderful! It is gorgeous!!!! Thanks for sharing. I love your blog. There is so much fun and awesome things in there! 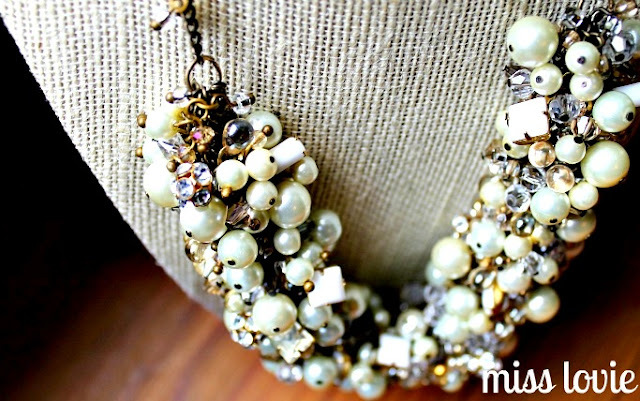 This is a gorgeous necklace. You did an amazing job! I just linked your tutorial to my blog. I made modifications but made sure you got credit. Great tutorial! Awesome! I have to make a post for my blog and link your tutorial! 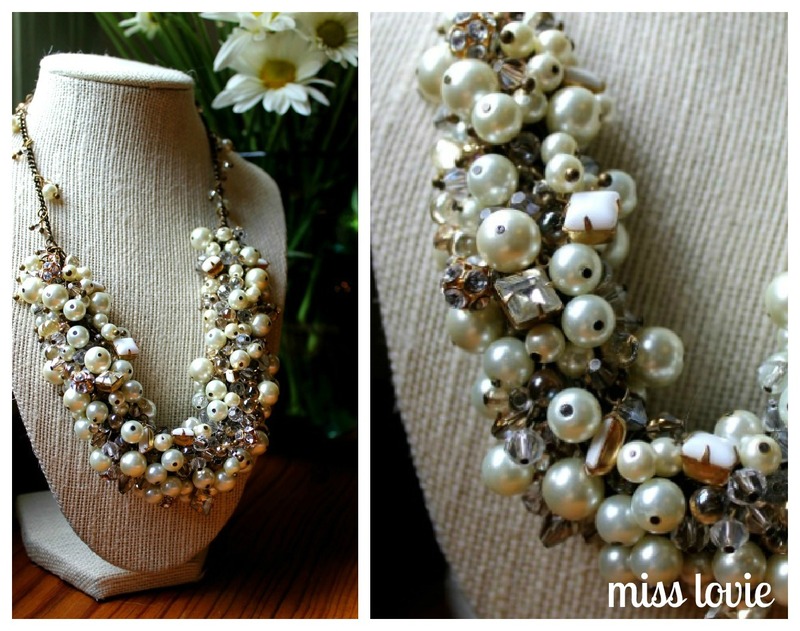 Fabulous describes this necklace perfectly. I would like to try this with colored pearls, maybe monochromatic or even multi-colored. I'm going to do a smaller version, maybe only 4 chains just for a prototype, keeping the cost down a bit. Thanks so much for sharing your knowledge and design skills. Great! I love it. Thanks you. Allie! Thank you so much for posting such a detailed tutorial! Your necklace turned out beautifully, and you really helped me with a paper bead necklace project.